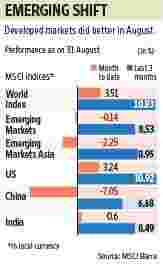 The last month has seen a change in the performance of equity markets. While the emerging markets used to beat the developed equity markets easily when the current rally first started, we’re now seeing a shift back to developed markets. But as the chart shows, it’s not just China that has done worse than the developed markets. India, Indonesia and Brazil have all underperformed. On the other hand, the Emerging Markets Eastern Europe Index did quite well in August. The implication seems to be that all money is now rotating to those markets that weren’t doing so well earlier, as more and more signs of improvement in their economies are seen. Earlier, the growth story was only in emerging markets such as China and India. But now other regions, such as the developed world and eastern Europe, are also seeing signs of improvement, which is why money is flowing there. Also, the rush of money to India and China has driven up valuations, encouraging a search for other markets. As fund tracker EPFR Global points out: “US equity funds attracted net inflows for the fourth time in five weeks during late August as signs of life in key housing markets gave credence to official pronouncements (that) the worst is over for the world’s biggest economy. US large cap ETFs (equity traded funds) again accounted for the bulk of the inflows, which totalled $4.77 billion." With conditions in developed economies getting better, brokerages are now advising investors to bet on a global recovery. For instance, in a note on equity strategy dated 20 August and titled Shift to Global Recovery Plays, Deutsche Bank AG says: “On the back of increasing evidence of a turnaround in US economic growth and, with a lag, growth momentum in Europe, investors must begin taking a close look at global recovery plays in India. We would expect three sectors to be the key beneficiaries of the return to global economic growth—software, metals and mining, and oil and gas. Of the three sectors, we believe that presently the software sector looks most attractive, followed by metals." The markets certainly believe in the software revival story, which is why the Information Technology Index on the Bombay Stock Exchange has outperformed the benchmark Sensex index handsomely during the past one month.